Tuffy Stone is a classically trained French chef, television personality and accomplished pitmaster who can be considered the most successful guy on the competitive barbecue circuit over the last few years. He is a judge and host on the Destination America reality television show BBQ Pitmasters since 2009. Tuffy is the head cook on the team “Cool Smoke” and co-owns four Q Barbeque restaurants in Richmond, VA. He recently opened a fifth restaurant, Rancho T, in April 2015. Before his success on the competition barbecue scene, Tuffy was best known as one of the premiere caterers in Virginia as the co-owner and proprietor of A Sharper Palate Catering, a top rated catering and events firm in Richmond. 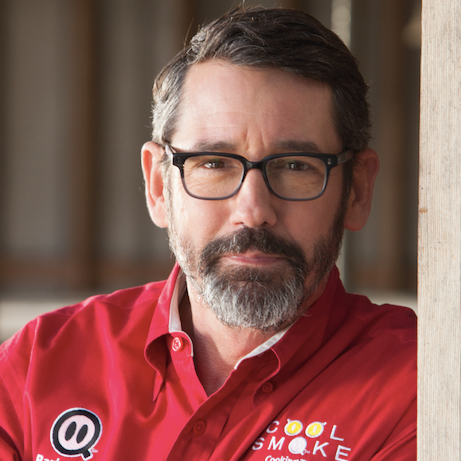 He has earned Grand Champion titles in nearly every major barbecue competition on the circuit. In 2013 Stone took home two World Champion titles while only cooking eight contests and he followed up in 2014 with another World Championship title, winning the American Royal Open. That year he also won 1st Runner Up at the Houston Live Stock and Rodeo World Championship, and took 2nd place in ribs at Memphis in May. Tuffy has won contests all over the country, including back to back wins at the American Royal World Series of Barbecue, Grand Champion at 2013 Jack Daniels World Championship Invitational, and First Place in Whole Shoulder at the 2010 Memphis in May World Championship to name a few. Most recently, Tuffy took home the top prize in competition barbecue, winning Grand Champion at the 2015 Kingsford Invitational.